Here's something you probably don't know: until these past few weekends, I've never listened to a Bon Iver record. Oh, I knew Justin Vernon and his willowy croon. I knew he had a knack for melody and heartfelt but oblique lyricism over a misty cocoon of indie folk instrumentation with hints of electronic embellishment. I knew the waves of critical acclaim that had been piled on the record as one of the main acts behind the indie folk boom of the early 2010s. But it was one of those cases where I knew their sound far more by reputation and those they inspired over the past decade than their actual music. And in some sense that's a problem, not just in the inflation of reputation but also a sound we've seen grown and develop over the past few five or so years - and for the longest time that was fine, as I didn't think I'd have to care. After all, the band was on hiatus, there was no sign they'd ever make another album. And yet they did and as such I went into Bon Iver's first two albums... and I'm not sure what to tell you all, because while I liked it, I didn't fall in love with it the way I think so many people did around the turn of the decade. It was pretty, the writing mostly worked, Justin Vernon did his ethereal thing... I just didn't get sucked into it as much as I wanted. I will say while For Emma, Forever Ago is probably the better record, Bon Iver, Bon Iver does have some strong standouts when the songs build a little more of a groove and foundation to them. So okay, with that in mind, did the newest major stylistic shift on 22, A Million work for me more? Here's the thing: I don't hate this record and what it's trying to do. 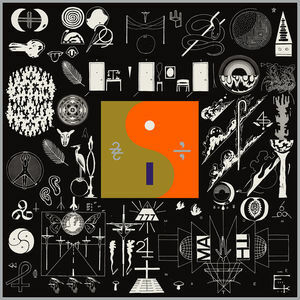 But the more I listened through 22, A Million by Bon Iver the more I found myself wondering why so many people were losing their minds about it. I mean, it's certainly pretty and has moments that tap into some gorgeous melodies, but this certainly isn't revolutionary or genre-pushing, even by the standards of blending indie folk with electronica. Elvya took a more ethereal, borderline mystical approach last year with Untold Stories, Hundred Waters' brand of glitch was more brittle and tight on The Moon Rang Like A Bell in 2014. That year we also had Casualties of Cool, which was far more composed, textured, and interesting. Hell, Imogen Heap already tapped into this sound as early as 2005 with Speak For Yourself and pushed all the further with Sparks in 2014, and yet people are still saying that Bon Iver are revolutionizing the sound? Again, this is a good project and does hit some beautiful moments, but it's not better than any of the records I just mentioned, and I'd argue the praise is pretty overblown at this point, especially considering what Bon Iver sacrifices to get there. And the biggest culprit of that is song structure, especially in the instrumentation and production. Frankly, I'm amazed that they managed any transitions at all between tracks, because this album is a complete mess on a compositional level. I wouldn't be surprised if half of these pieces are purely improvised, like what we seem to get on '____45_____' between Vernon and the saxophone layers, but even then makes for a jarring as hell listen as we try to discern established pieces of melody from overloaded beats, vocal overdubs, and a mix that lets it all fly free - which yes, can make for some soaring moments but no defined control of any distinct pieces. And while it means some fragments blend in - most of the vocal samples fit okay, arguably being the best parts of both '22 (OVER S∞∞N)' and '00000 Million' - every other contortion they put the vocal lines through really feels garish and overdone, from the pitch-shifting to the cacophonous overdubs to the autotune to the vocoder they abuse on '715 - CRΣΣKS', which is a blatant riff on Imogen Heap's 'Hide And Seek' but nowhere near as good. I liked the piano melody on '33 "GOD"', but then you add in chipmunk vocals and a thicker beat and a guitar trying desperately to add some texture and it honestly just feels overmixed. Similar case for '29 #Stratford APTS' - good acoustic line, the arranged instrumentation was beautiful, the vocal harmony was solid, but then you throw in blaring vocoders and it shatters any sort of immersion. '8 (circle)' actually was pretty promising with the sax layering until we throw in more vocal fragments that just become unbearable, and '21 M♢♢N WATER' is just a mess, trying to build a collage of stormy fragments against that glossy background synth that when it dissolves into a sloppy mess with added horns to boot, it kills the atmosphere for me. With '666 ʇ' and '00000 Million' there's at least a little more structure and groove, in the former case there's a beeping melody and a hint of real bass, and the latter is a borderline piano ballad - there's focus and the songs actually come together, what do you know! Because look, I get this fragmented approach: it serves to drive that sense of intentional duality - we'll come back to this - and sure, it can lead to some beautiful moments, but they feel constantly undercut. On a larger scale this has been a problem I've seen crop up more than a few times in 2016, sacrificing the cohesion of the song for fragments and emphasizing contrast like what we saw on The Life Of Pablo by Justin Vernon's occasional collaborator Kanye West. But this is a high risk, high reward approach, because you don't just lose structure but also a great sense of dynamics and flow, not just between songs but within the song. Good production can smooth over these patches, but with the ragged shifts in fidelity, especially in the vocals, you end up emphasizing the divide rather than the strengths of the individual piece, which leads to weaker tracks as a whole. And yes, I get the underlying clash of sounds is part of the thematic point and draws in tension, but if you can't find a balance in tones it's not going to click as a whole - you're not going to hit equilibrium. Might as well get to the lyrics and themes here, then, and look, I read through all of the annotations on Genius in depth and then did my own analysis, all with the reservation that Justin Vernon has admitted he writes lyrics that often sound good over the melody rather than outright make sense. So with that in mind, what you get here is scattershot and impressionistic at best, all about emphasizing dualities. Heaven and hell, life and death, good and evil, organic and electronic, atheistic and spiritual, Justin Vernon vs. his audience or his instrument, nearly every song on this album explores that split, with the tension and indecision being defined by being caught in the middle. And when you consider that across this album Justin Vernon goes looking for answers and finds very little, the overarching theme becomes less about choosing a side and more about finding comfort in the middle ground to free himself of this feverish paralysis. You think that finding that middle ground would lead to a synthesis in electronic and organic sound, but to his credit Vernon asserts it's more about living with the tension than finding the blend, which drives the strongest artistic expression - which are analogous themes to what Dan Bejar explored last year on Poison Season in far more eloquent, succinct, and well-composed songs that used the horns way more effectively, but I'm getting off-track. So okay, themes mirrored by composition and most of the lyrics, I can get behind this... until you start examining lyrics in microcosm. For one, I've never been a fan of Vernon's paradoxical 'tragic sensitivity meets genius swagger' that's across all of his albums which leads to lyrical gems like 'we know I'm right, seriously' on '666 ʇ', or the love that's just as quickly abandoned but devotion yet demanded on '715 - CRΣΣKS', or the petulance of '33 "GOD"'. Now at least on the second track or '____45_____' he can admit he's paralyzed in raw tension, but the line I want to call out is on the final song '00000 Million': 'A word about gnosis: it ain't going to buy the groceries'. Now 'gnosis' is a Greek word that reflects knowledge or insight, typically spiritual and secret - you know, what Justin Vernon spent most of this album seeking through the sort of esoteric lyrics that cast a very different implication on the record as a whole. Within the song it's an admission not to seek the apex of enlightenment by knowledge or religion - fine, I guess - but it's also one that can be considered about 22, A Million itself. You spend time trying to decode Vernon's writing, which is the furthest thing from straightforward and often ties itself in lyrical knots with invented words and triple negatives and a pileup of half-connected symbolism, and then you get this line where he then belittles searching for this insight. If I believed that Vernon was more self-aware I'd swear he's giving the middle finger to his fans overanalyzing his work, but given I myself went through this exercise, it rings as a moment that feels overwhelmingly arrogant and isn't earned. Because let's get real here: the overarching 'duality' themes of this album break down to 'life isn't black and white, live with it', and yet with the language chosen for the lyrics and the high-minded ideas and the messy clash of instrumental tones and production choices, the fact it all breaks down to this... well, it's the dictionary definition of pretentious. And yeah, I completely get the irony coming from me sometimes, but it doesn't make it any less true and I can at least admit it. So while there are some beautiful moments here, enough that I'm giving this record a 6/10, I don't think I can recommend this, mostly because it's not nearly as experimental, boundary-pushing, or profound as it thinks it is. Bon Iver fans... if you like this, you can have it, but I'd check the Kid A and Age Of Adz comparisons at the door. Even though I'm not hugely fond of either record, they actually did break down boundaries - 22, A Million just goes around in circles before writing itself into a corner.